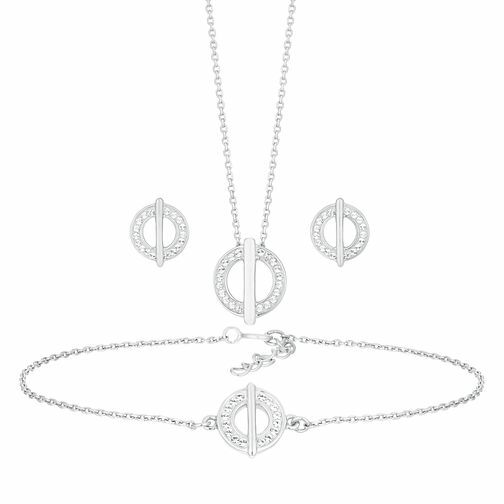 This elegant jewellery set by Evoke encapsulates elegance at ease. Crafted from rhodium plated sterling silver, these co-ordinating circular designs are brought to life with gorgeous glimmering Swarovski crystals. Fine silver tone chains hold these attractive crystal embellished circle designs in place for the bracelet and pendant. The matching stud earrings complete this stunning set, the ideal finishing touch to your look. Evoke Silver Rhodium Plated Earrings, Pendant & Bracelet Set is rated 4.5 out of 5 by 2. Rated 5 out of 5 by Anonymous from Great quality 40th birthday present.would highly recommend.my friend absolutely loved this present.price was excellent too . Rated 4 out of 5 by Anonymous from Lovely set All items match nicely, they are well presented and a lovely gift for a loved one.